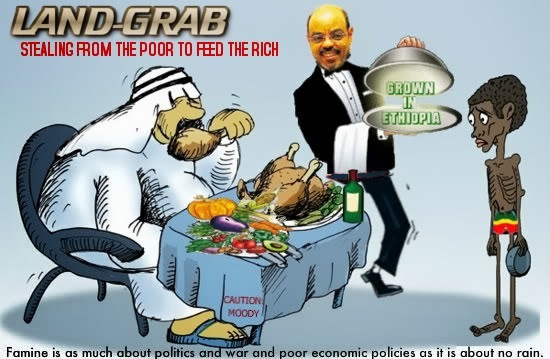 According to the Guardian (UK), Ethiopia has offered three million hectares (7.4 million acres) of virgin land to foreign corporations at knocked down prices. The Ethiopian government says 36 countries including India, China, Pakistan and Saudi Arabia have leased farm land there. One of the biggest buyers are the Chinese. The Ethiopians have sold their land to China for 100 years. They could do whatever they want with that land. Now, they are cutting the rain forest and turning it into farms. Moreover, as you know, in China, there is one-child policy, that is, they could not have more than 1 child in a family. However, in Ethiopia, they do not have that limitation. Once they populate Ethiopia, do you think they will leave Ethiopia after 100 years? Be that as it may, after the Ethiopians have sold their lands to these foreign investors, with that money, they are feeling good –at least for now. For now, they are able to build few highways here and there, and few more high-rises here and there. However, this will undoubtedly be very short lived. Take for instance, our neighbors in Eritrea. They could also have done the same. The government could have sold the potash and gold mines to foreign investors now and could have given the Eritreans temporary solution. The difference is Ethiopia is interested in a temporary solution within a short time now --at the cost of a potential long-term conflicts and instabilities; while Eritrea is looking into a permanent solution and long-term stability --at the cost of self-sacrifice now. Palestinians were also happy when they sold their lands to the Jews. With that money, momentarily, they felt good. However, their temporary dream was turned into a long-term and perpetual nightmare. Little did they know that this simple, seemingly harmless act would result in their imminent, slow and painful death. Little did they know, that, when they signed off their lands to the Jews, they were also signing off their own doom with their own hands.